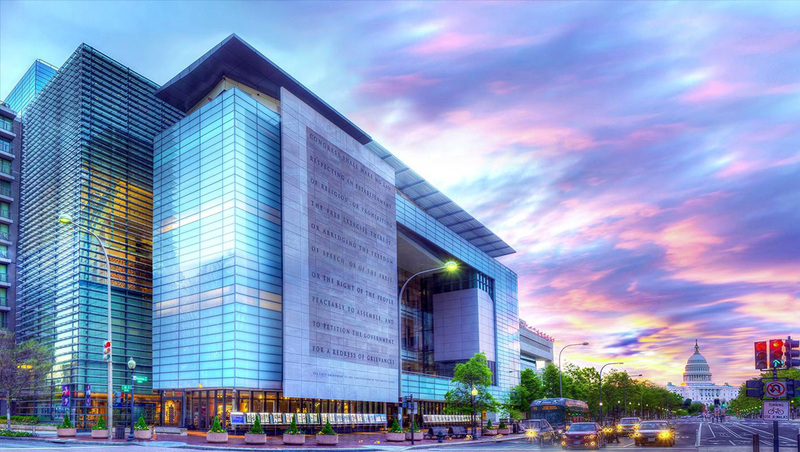 Johns Hopkins University has entered into an agreement to buy the Newseum in Washington, D.C., which will eventually lead to the public museum that the building is named for closing. The building, 555 Pennsylvania Avenue NW, was opened in 2008. It is owned and operated by the Freedom Forum. Previous the organization operated a significantly smaller version of the museum dedicated to journalism, freedom of expression and the First Amendment, in Arlington, Virginia, since 1997, but closed that building in 2002 to focus on the new, expanded building. The 643,000 square foot building cost a reported $450 million and features seven levels of galleries. However, the museum struggled to meet its attendance goals after opening the larger scale facility, which lead to it becoming unsustainable to operate, so the Freedom Forum announced a review of its financials including closing or selling the building. A popular outdoor feature is printouts of the front pages of newspapers from around the world that are fed electronically to the building and printed out on large format printers each day. The sale price to Johns Hopkins, whose main campus is in Baltimore is reported at $372.5 million. The university will renovate the building beginning in late 2020, work that is slated to take two years. The Newseum, meanwhile, will wind down operations by the end of 2019. There is no word yet what will happen to the museum’s artifacts, which range from small items such as vintage cameras, microphones, laptops and notebooks used by notable journalists to a section of the Berlin Wall, the Unabomber’s cabin and a car used by the 9/11 hijackers. There’s also no word what will happen to a memorial to over 1,800 journalists who have been killed while doing their jobs. The Freedom Forum was founded by Gannett founder Al Neuharth and although the Newseum is perhaps its most visible project, it also has a stated mission of helping the public better understand the First Amendment. The closing of the Newseum comes at the end of a dark week for journalism: Gannett’s newspaper division announced a round of layoffs this week, as did BuzzFeed. In addition, the announcement comes shortly after Time magazine named “The Guardians,” its name for those journalists killed, injured or jailed while gathering the news, as its pick for “Person of the Year” in 2018.